Community Supported Agriculture (CSA) is an alternative economic model of agriculture and food distribution in which neighbors join together to support a local farm by purchasing “shares” of the season’s harvest. The Prospect Park CSA, founded in 2011, partners with Windflower Farms, a family-owned, organic farm in upstate New York. The farm is run by Ted and Jan Blomgren, their son Nate, and a small dedicated staff. Each spring, PPkCSA members pay Ted and Jan for a share of their vegetable harvest. (Members can also add optional fruit, egg, and flower shares.) The collective, up-front payment gives the Windflower Farm team the resources to get the season going, and it makes CSA members investors in risks and rewards of sustainable food production. 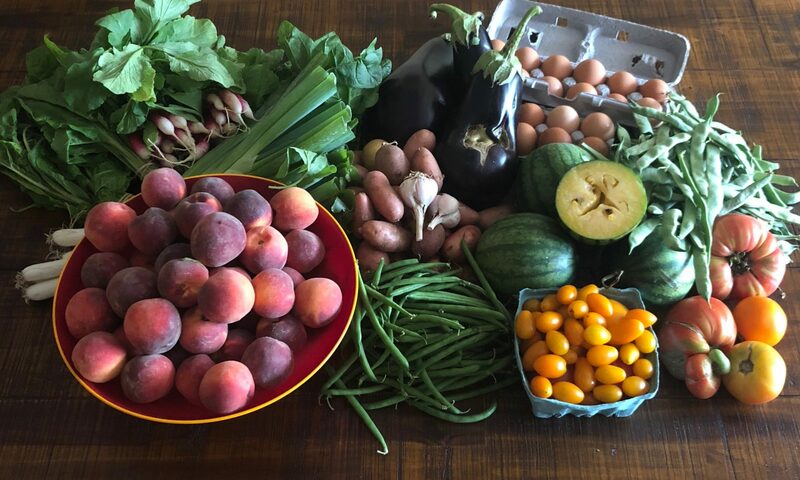 Then, throughout the 22-week season (June through October), members receive their weekly share of the farm’s harvest, delivered each Tuesday to our neighborhood distribution site (Crow Hill Cross Fit, 1010 Dean Street). The CSA is 100% volunteer-run. Every member pitches in by committing to one or two short work shifts per season (one for a half share, two for a full share). A “core group” of volunteer organizers manage registration, communication, logistics, and events. In addition to weekly shares during the regular growing season (June through October), PPkCSA and Windflower Farms offer a monthly winter share. The winter share is distributed one Saturday per month (November through February) and consists of a one-bushel box of hardy greens, root or storage vegetables, autumn fruits, cider, preserves, and more. Optional shares in the winter include eggs and maple products. As a Prospect Park CSA member, you’ll eat locally, seasonally and ultra-fresh. You’ll learn about how your food is grown and get recipes and storage tips. You’ll be invited to the annual Windflower Farm Potluck Open House—a magical weekend of farm tours, swimming holes, and friendly guitar-picking around the campfire every August. You’ll be part of a community of neighbors with a common interest in food and sustainability. And you’ll pay far less per week (averaged over the season) than you would for comparable produce at a supermarket. Joining a CSA also means being part of the food justice and sustainability movements. Industrial agriculture and factory farming are poisoning us and our planet, and for every dollar consumers spend on food in retail food stores and restaurants, farmers gets on average only 7.8 cents. Becoming a CSA member means fighting back by supporting an alternative model that prioritizes human health, environmental conservation, and small-scale farmers. Support small-scale, family farms in the New York region, prioritizing the work of Ted and Jan at Windflower Farm and neighboring producers they recommend. Foster community and trust amongst our members, farmers, peer CSAs and neighbors. Cultivate inclusiveness and diversity in our membership and organizing with an ethos of welcoming hospitality. Seek transparency in organizational decisions to synthesize the best solutions for Prospect Park CSA members and farmers Ted and Jan.
Advance food justice, to the best of our abilities, with flexible pricing and payments, food pantry relationships, community bridging, and more. The Prospect Park CSA is a volunteer-run organization. Below is the core group of organizers who—alongside dedicated members working their shifts—make it all happen! What’s your role with PPkCSA? Weekly email writer, daily email inbox tender. What do you do when you’re not volunteering with the CSA? I freelance in media and performance and am finishing an MFA at Hunter College. My thesis has me foraging the Bushwick streets with my dog, looking at “weeds” and thinking about implicit value, remediation, and climate change. Also I eat tacos. Lotsa tacos. What’s your favorite thing about the CSA? The idea that we can create an alternative, community-centered food model that strikes back against megacorporate agribusiness. Being in a CSA helps me remember that my environment and my food are directly linked, and that context and climate have a direct impact on my life! What is your role with PPkCSA? Work shift coordinator, distribution protocols, and liaison to Farmer Ted. What do you do when you’re not volunteering with the CSA? I’m a chef, culinary instructor, and founder of Teaching Table, transforming local, seasonal foods (like our gorgeous CSA bounties!) into healthy-ish eats for all occasions. My best times are with my husband and two kids. I work out at Crow Hill Cross Fit, and I love cooking, eating, wine, yoga, ​gardening, the great outdoors and traveling. But mostly eating. Why did you become involved with the CSA? I believe in supporting local farmers and in delicious produce. Helping launch Prospect Park CSA in 2011 was a way to ensure my access to a vegetable and fruit share and make access possible for others in our neighborhood. What’s your favorite dish to make with CSA produce? Carrot bread, zucchini muffins, pumpkin pie and apple cake. Oh, and corn chowdah—cause I’m from New England. What is your role in PPkCSA? Distro site staffing, tinkering with forms, food pantry liaison. What do you do when you’re not volunteering with the CSA? I teach art and writing, doodle, make ceramics, and overwater my houseplants. Why did you become involved with the CSA? A chef and food activist friend convinced me to split a share in 2014, and it snowballed from there. The CSA has become a great part of our routine and community in Brooklyn. What’s your favorite thing about the CSA? The farm camp-out in August is magical! But the best is bringing my 5yo son along to help open distro and sharing an apple or a handful of green beans on the walk home, knowing he is on a first-name basis with the people who grow his food and has petted the healthy happy chickens that lay our eggs. What’s your role with PPkCSA? Registration, finances, and Lewis Waite liaison. What do you do when you’re not volunteering with Prospect Park CSA? I teach in NYU’s food studies program and consult with nonprofits working in food, arts and culture, social justice, open space and the environment. Why did you become involved with the CSA? I’ve been a member since 2012. It’s important to me to support the kind of agriculture I believe in, and I’m a sucker for beautiful vegetables. My current work schedule is more flexible than in years past, so I figured it was a good time to get more involved. What’s your favorite dish to make with CSA produce? It’s crazy in the heat of summer, but on Tuesday nights I crank up my oven and make cast-iron skillet pizza with whatever goodies Ted showered on us, followed by a bountiful breakfast salad the next morning. What’s your role with PPkCSA? Primary distribution site coordinator. What do you do when you’re not volunteering with the CSA? I design the florals for weddings and events and try to catch up on unread New York Times. Why did you become involved with the CSA? I recently switched from lawyering to floral designing, so I have more free time during the week and am trying to be more active in the community, rather than toiling away on wedding proposals all day! What’s your favorite dish to make with CSA produce? Vichyssoise! At the end of the season when there are heaps of potatoes and onions, I make giant batches of vichyssoise. It’s simple and comforting. What’s your role with PPkCSA? Site coordinators. What do you do when you’re not volunteering with the CSA? Marian runs a natural skincare and cosmetic company called Half Hippy, and Dominic is a DJ and music producer. Our bunny, Lola, eats most of our CSA share. Why did you become involved with the CSA? Our good friends Candace and John asked us if we wanted to help out last year, and now we can’t remember how we ever went without CSA veggies! What’s your favorite spot around the neighborhood? Outpost. What’s your role with PPkCSA? Site coordinator. What do you do when you’re not volunteering with the CSA? I work or cook or run or find somewhere sunny to be! Why did you become involved with the CSA? I love fresh local food and feeling connected to a community. What’s your favorite dish to make with CSA produce? It’s not really a dish, but I love when we get fresh potted basil that I can plant in my windowsill, or corn that I can eat right away just as it is!